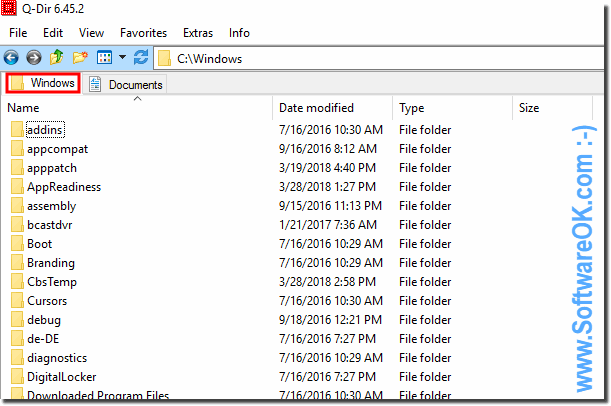 If you like to see the full name of the folder in the tab of explorer view in the file manager Quad-Directory! ►► Folders expand too quickly at drag over, in Tree-View! ►► disable color highlighting of files and folders! (Image-1) Full name of the folder in the explorer tab! Q-DIR - FAQ-65: I would like to see the full name of the folder in the tab! # One feature I would find useful is if the tabs above the list-view could be variable width, so that folder names are not cut off. In other words, I would like to see the full name of the folder in the tab, rather than just the first part and then "...".